In a fast paced service or transport business, it’s no mean feat getting the right resource to the right place, at a time specified by the customer. Add to that the complexity of booking jobs for multiple resources simultaneously. JobWatch lets you do all of this with ease. It takes into account multiple constraints such as time, service level, skill set, tools required and vehicle attributes. The result is an optimised service operation that is empowered to deliver a first time fix. JobWatch lets you create and schedule new jobs in seconds. Pre-defined job types and worksheets let office-based teams allocate the correct workflow and instructions to jobs rapidly. Then the intelligent scheduling assistant chooses the ideal resource (i.e. lowest cost, within proximity and with the correct skills, tools and qualifications). The job is then instantly relayed to the mobile worker to be accessed on their mobile device. The scheduling assistant will also alert you to unfeasible jobs given drive time and work time required. 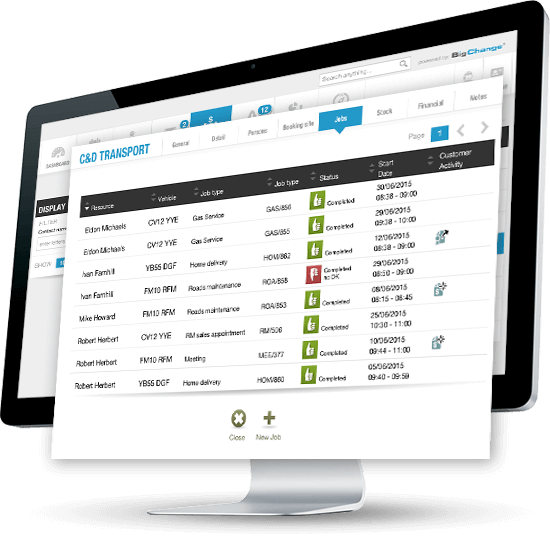 The Gantt schedule panel provides a clear and up-to-minute view of the schedule for each resource and can be viewed either by vehicle or by resource. Colour coding on the schedule provides an instant live view of status and progress against the plan. Jobs and resources can also be viewed on the live tracking map.